Tea has been a central part of society for centuries. The ancient Greeks and Romans, indigenous tribes in the Americas and monks in Asia used tea as a medicinal herb. Tea is a key part of social engagements, where it plays a central role in political meetings and celebrating special occasions. Tea culture varies dramatically in style from Japanese tea ceremonies to a simple afternoon cuppa with friends and family on the veranda. Tes is beloved by cultures as diverse as the Americans and Portuguese and comprises a large portion of exports in African countries such as Kenya. Tea preparation also consists of elaborate rules for how to brew tea depending on local tradition. Tea accessories can turn an ordinary cup into a special ceremony, making this a beverage that has the power to unite communities and heal various ailments. Tea originated in China where it was used under the Shang dynasty in traditional medicine, but didn’t gain nationwide attention for recreational use until the Tang dynasty. Portuguese priests were the first Europeans to discover tea when they resided or traveled through China in the 15th century. Tea was first introduced to Europe during the 16th century and it took 100 years to become the staple drink of Britain in the 17th century. Tea was at the center of numerous world changes from colonization under the East India Company to the events of the Boston Tea Party. On the other side of the globe, tea consumption was widely used as part of spiritual and community events in the Americas. In South America, yerba mate was believed to be the drink of the gods, which offered tea drinkers deep insight into their own beings and the world around them. Yerba mate is a deeply spiritual South American drink that is often compared to ayahuasca when it comes to combining beverages and philosophy. By 2016, China and India produced over 60% of the world's tea. 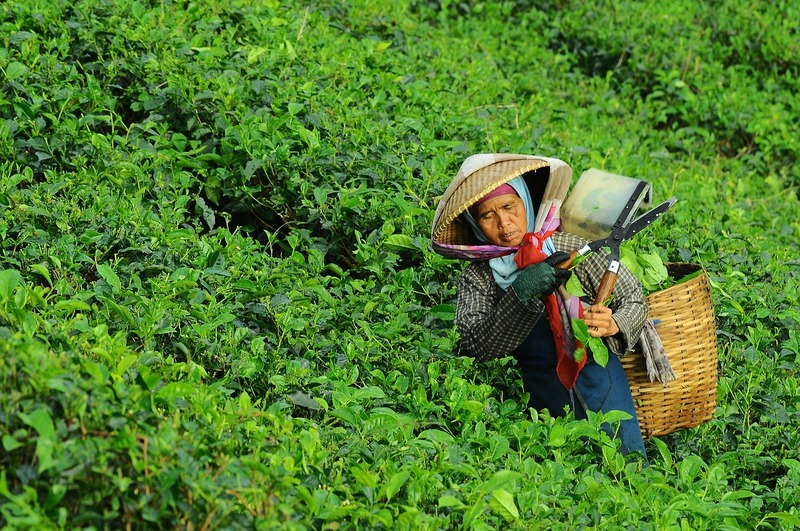 Over the centuries, tea production has increasingly moved from hand manufacturing to machine production. However, it is still easy to find several tea varietals that are produced using artisanal methods. The differences between the thousands of different teas can be boiled down to the tea growing process and tea processing methods. 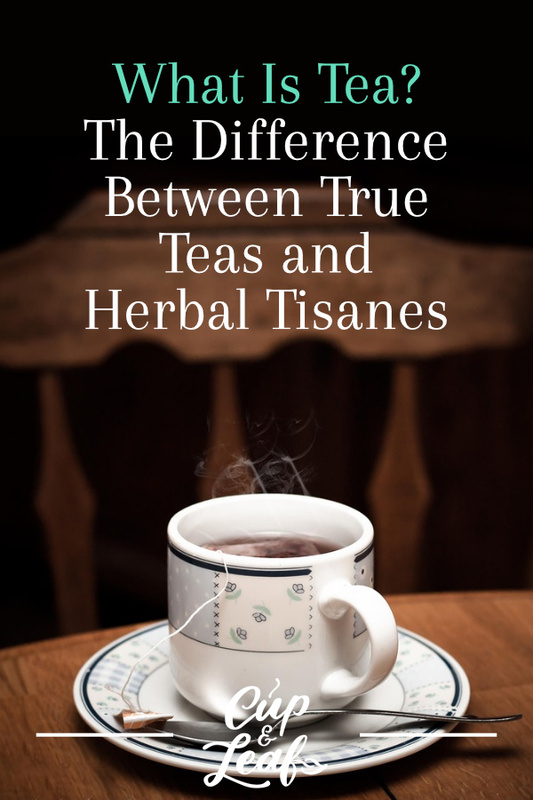 There are two main types of tea: true teas and herbal teas, also known as tisanes. The true teas are all derived from the Camellia sinensis plant, known commonly as the tea plant, and include green tea, white tea, black tea, and oolong tea. The tea plant is an evergreen plant that grows in a host of climates, which can lend different flavors to each unique brew. Herbal teas or tisanes, are entirely caffeine free and are not made using any leaves of the Camellia sinensis plant. Instead, these herbal blends are made using spices, flowers and leaves of a variety of other plants including fruits and herbs. Often times, herbal teas are made using true tea leaves for distinct flavors—known as herbal infusions. Herbal infusions can be categorized as black, green, white and oolong depending on which tea leaves and processes are used to create the herbal blend. Even though all of the true teas come from the same plat, they are distinct due to the oxidation or fermentation process of the tea leaves. Oxidation is a naturally occurring process that alters the color and flavor profile of the tea leaves. The leaves are harvested from the tea plant and then rolled either by hand or using a machine. The rolling process creates tiny cracks that allow oxygen to react with the plant enzymes leading the the different types of true tea. Green and white teas are not oxidized and are simply allowed to dry after harvesting. The leaves are not crushed, but are instead subjected to drying either in the sun or by pan firing. Black tea on the other hand is fully oxidized while oolong tea is partially oxidized. Tea cultivators are experts at oxidizing leaves and in some cases the process is repeated many times over or using certain artisanal techniques to develop precise aromas and flavors. In general, teas that are fully oxidized such as black tea, develop stronger flavors and aromas and will be dark brown or a rich burnt red in color. Lesser-oxidized tea, such as white tea, will feature a smoother, more delicate flavor and will be light green or yellow in color. 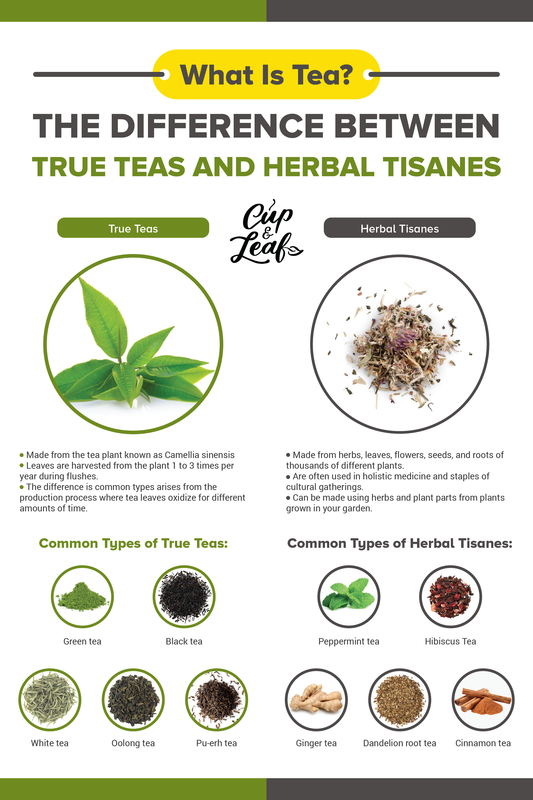 Now that you know why teas are different on a production level, we'll lay out how they differ in taste and health benefits. Black tea is one of the most popular teas worldwide and it is also the most processed of true teas. Leaves are harvested and immediately withered where they are then rolled to release enzymes, which react with oxygen. After rolling, the leaves are spread out one-by-one to allow full oxidation to occur. Once the leaves turn brown, they are fired to prevent additional oxidation and flavor changes. The oxidation process of black tea lends strong, robust flavors to this tea. This tea has a strong flavor profile and is typically a deep brown, burnt red or black color,. Described as malty and rich, black tea features hints of dark chocolate, dates and raisins. Black tea also contains the highest caffeine content of all true teas, except matcha green tea, with 60 to 90 milligrams in every 8 ounce cup. There are several popular types of black tea including Darjeeling, Assam, Ceylon and English breakfast. Assam and Darjeeling are cultivated almost entirely in India with the former tasting full-bodied and strong and the later floral and fruity. Ceylon black tea is cultivated mainly in Sri Lanka, tastes strong and bold, and varies from burgundy brown to golden honey in color. English breakfast tea is a beloved favorite of the British and often includes Earl Grey breakfast teas, which feature a hint of bergamot for a citrusy taste. Oolong tea is partially oxidized and often described as having blended characteristics of both green and black tea. Known in China as wulong tea, these leaves are typically brown in color an result in an even, full-bodied brew. Oolong tea leaves are cultivated solely in Southeastern China and Taiwan. It is among the most expensive and highest quality teas in the world. Oolong tea is steeped in cultural tradition and can feature the widest variety of flavor profiles compared to the other true teas due to its varied production process and traditional brewing methods. Oolong tea leaves are placed in a bamboo basket, where the leaves are softly rubbed to encourage reactions with oxygen. Tea masters pay careful attention to only scratch the outer surface of the tea leaves, while leaving the center intact and vibrant green. As the tea oxidizes, oolong teas become either a medium green or deep amber color. Dark oolongs feature hints of chocolate, and burnt sugar while lighter oolongs offer flavors that are more floral and smoother. In terms of oxidation, green tea is the second least processed tea. This tea is a tad stronger than white tea and packed full of antioxidants. It features a pale green color that is most similar to the actually appearance of tea leaves. Green tea is made using leaves that are allowed to wither until they are loose and floppy, at which point they are immediately dried. The leaves are either fired or steamed using a variety of techniques including pan-firing and roasting. During the drying process, tea masters roll the leaves into long, thin twig shapes or pearls depending on the green tea varietal. Generally, Chinese green teas are pan-fired or roasted, whereas Japanese green teas are typically steamed at high temperatures. The roasting lends a smooth, aromatic flavor to green tea while steamed leaves tend to have a more vegetal, herb-like quality. The flavor of green tea can vary dramatically ranging from grassy and earthy to nutty, roasted and freshly floral. Much like wine, green tea flavor profiles depend on terroir, a term used to describe the impact of region, climate, soil, weather and origin on the taste. A green tea cultivated in China for example, will taste far different from one cultivated in Japan or in sub-tropical climates. Green tea is suited to most tea drinkers although it can be bitter if brewed too strong or for too long. For tips on brewing your green tea, head here. Pu-erh tea is defined as a post-oxidized tea. The tea leaves of the Camellia sinensis plant are subjected to heat, which kills the enzymes that are responsible for oxidation. This means that the plant undergoes minimal processing and isn't allowed to oxidize. Since it is not oxidized, pu-erh is effectively considered a subtype of green tea. That applies to raw pu-erh tea, but what about aged pu-erh teas? Essentially aged pu-erh tea is allowed to develop flavors over time just like a fine wine. A microbial process oxidizes the leaves instead of the standard oxidation process that uses air. Leaves are aged for 10 to 15 years during which the natural oxidation occurs—this is why it is referred to as post-oxidized. The health benefits and flavor compounds of aged pu-erh tea are more similar to black and green teas because of this oxidation. Due to the natural oxidation, some tea drinkers considered aged pu-erh tea to be a separate true tea. White tea is the least processed of the four tea varietals. This tea is made using only the baby tea leaves so harvests take place over just a few days in springtime. White tea is often considered one of the healthiest and most natural teas since it is not processed and simply undergoes natural drying. This tea features a delicate, yet complex flavor. White tea is suitable for connoisseurs who appreciate the rarity and complexity as well as for beginners to tea drinking who can appreciate its delicate, sweet flavor that is free of astringent tastes. The two most popular types of white tea are Silver Needle and White Peony commonly known in China as Bai Hao Yin Zhen and Bai Mu Dan. Silver Needle is considered the highest quality as it uses only the silvery white buds of the plant rather than whole leaves. Silver Needle features a delicate burst of flavor that is naturally sweet and reminiscent of honeysuckle. White Peony is made using the bud and the first two leaves of the tea plant. The inclusion of the leaves makes White Peony more robust in flavor and darker in color than Silver Needle. Every tea offers a unique, flavorful experience that can awaken or relax your senses. Drinking tea is a great way to unwind after a day at the office or form community bonds by sharing a cup with new acquaintances. For homemade herbal teas, you can grow your own tea garden by cultivating, harvesting and drying your favorite blends including jasmine and masala chai. All you have to do is plant your favorite tea flowers, roots and spices and blend with true tea bags or loose leaf tea. Whether you prefer iced tea or tea brewed with hot water, there's a temperature—and a host of flavors—for everyone.